MCLEAN, VA--(Marketwired - Jan 16, 2014) - Freddie Mac (OTCQB: FMCC) today released the results of its Primary Mortgage Market Survey® (PMMS®), showing average fixed mortgage rates fall amid signs of a weakening economic recovery. 30-year fixed-rate mortgage (FRM) averaged 4.41 percent with an average 0.7 point for the week ending January 16, 2014, down from last week when it averaged 4.51 percent. A year ago at this time, the 30-year FRM averaged 3.38 percent. 15-year FRM this week averaged 3.45 percent with an average 0.7 point, down from last week when it averaged 3.56 percent. A year ago at this time, the 15-year FRM averaged 2.66 percent. 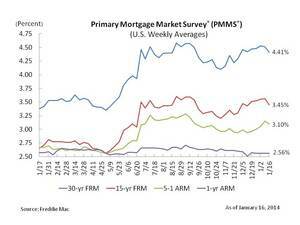 5-year Treasury-indexed hybrid adjustable-rate mortgage (ARM) averaged 3.10 percent this week with an average 0.5 point, down from last week when it averaged 3.15 percent. A year ago, the 5-year ARM averaged 2.67 percent. 1-year Treasury-indexed ARM averaged 2.56 percent this week with an average 0.5 point, unchanged from last week. At this time last year, the 1-year ARM averaged 2.57 percent. "Mortgage rates drifted downward this week amid signs of a weakening economic recovery. The economy added 74,000 jobs in December, less than the market consensus forecast. Retail sales rose 0.2 percent in December, which was nearly half of November's 0.4 percent increase. Meanwhile, the unemployment rate fell to 6.7 percent which was the lowest since October 2008."